Beautiful pair of Infinite Stones. Infinite Stone is an unusual and high vibration form of Serpentine (a combination of Serpentine and Chrysolite) and is found in only one area in Africa. It is often referred to as the ‘Healer’s Stone’, due to its remarkable ability to draw out any pain and negativity manifested in our body. 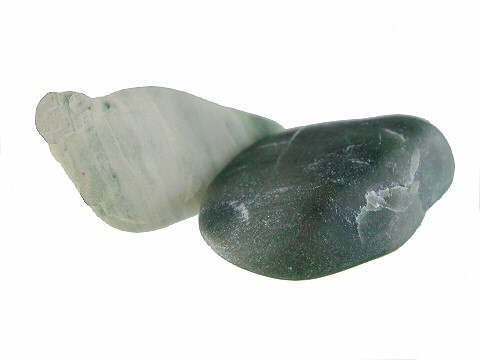 Some have gone so far as to call them miracle stones and they have a lovely, soft quite angelic energy. They are extremely useful for people who suffer from chronic pain but may also be of use for athletes who are be prone to injury. They may, however, be used for any condition where pain is present, whether chronic or acute, physical or mental or emotional. They are said to increase the effectiveness of energetic healing methods (like Reiki – try holding one in each hand during a treatment), can realign the auric field and can also assist in the progression of Kundalini in the subtle body. It comes in two main shades – light and dark – and whilst both are equally effective it is very much down to personal preference as to which to use. We have found, however, that having a pair is best, so are offering two for sale here – one dark and one light. Due to their ability to absorb pain and negativity, however, Infinite Stones do need to be cleansed regularly and thoroughly.